For years scientists have believed that orangutans are primarily arboreal. Indeed, most photographs and videos of orangutans depict them up in the trees. But a recent study published in the International Journal of Conservation, known as Oryx, challenges that thinking with photographic evidence that orangutans spend a lot more time on the ground than previously thought. The Bornean orangutan (Pongo pygmaeus morio) is listed as Endangered on the IUCN Red List of Threatened Species because the population has declined by more than 50 percent over the past 60 years. Scientists predict the decline to continue, primarily as a result of habitat loss when the forests that orangutans live in are converted to agriculture or lost to fires. On the island of Borneo most of the remaining orangutans live outside protected areas, so they are particularly vulnerable. A female orangutan carries her baby down a newly built logging road. Photo credit: Brent Loken. A team led by Brent Loken, a doctoral student at Simon Fraser University in British Columbia, Canada, conducted a two and a half year study in Wehea Forest in the Indonesian province of East Kalimantan in Borneo. Surrounded by logging concessions, Wehea Forest is comprised of 38,000 hectares of largely undisturbed rainforest that is home to at least nine non-human primates. The researchers set up a total of 97 motion-triggered cameras in three locales: an area of dense primary forest with a closed tree canopy in the heart of Wehea, an area of secondary forest inside Wehea that was last logged in 1996, and an area of recently logged forest just outside Wehea. 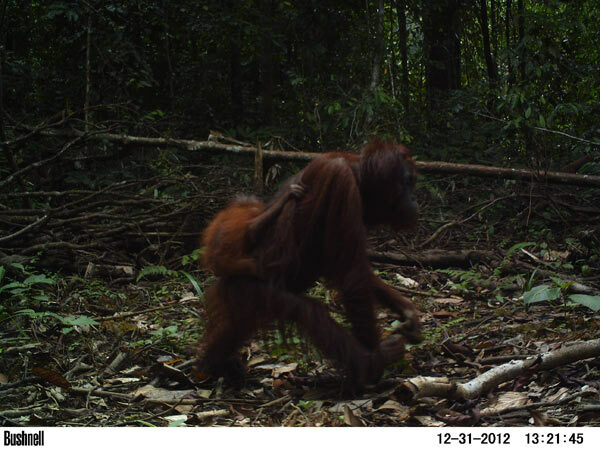 A young male orangutan checks out a camera trap set in a recently logged forest.Photo credit: Brent Loken. 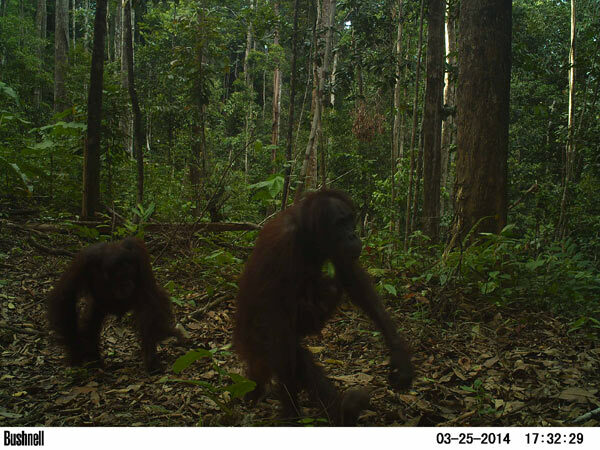 The camera traps yielded about 300,000 photographs, of which 296 were of orangutans: 44 in the primary forest, 63 in the secondary forest, and 189 in the recently logged forest. The researchers used two parameters to estimate the degree of the orangutans’ terrestriality at each of the three study sites: “relative abundance index,” a measure of the amount of effort needed to obtain a picture of orangutans in each forest area, and “ground-use score,” a measure of orangutan terrestriality. The researchers found that orangutans spent a lot of time on the ground in all three forest areas. Orangutans were most terrestrial in the recently logged forest, which makes intuitive sense given the lack of trees and canopy cover. However, orangutans were also highly terrestrial in the primary forest, where the canopy was closed and they had ample opportunity to move through the trees. This seems to indicate that there is no clear relationship between canopy cover and the amount of time orangutans spend on the ground. An orangutan family walks down a road in a recently logged forest. Photo credit: Brent Loken. Researchers previously believed that terrestrial behavior was uncommon in orangutans and that they came to the ground solely to acquire resources, although a handful of recent studies have begun to erode those ideas. Researchers also previously thought that males walked more often than females, especially those with babies. However, Loken’s study found that males and females spent nearly equal time on the ground. “Males and females, even females with babies, were recorded almost equally walking on roads, trails and ridges,” Loken told mongabay.com, adding that the team even recorded females with two infants and one female with twins walking on the ground. A female orangutan with a baby walks down a newly built logging road. Photo credit: Brent Loken. One young orangutan in particular seemed quite at ease on the ground. “We captured one set of pictures in which a young orangutan appeared to be thoroughly enjoying hanging out on the ground and we even photographed it turning summersaults,” Loken told mongabay.com. The photographs tended to show orangutans walking along roads, rather than crossing them, as would be expected if they were forced to the ground by a gap in the tree canopy. This suggests that orangutans take advantage of both anthropogenic features like roads and natural features like trails and ridges to move through the forest, indicating some level of resilience to human disturbance. 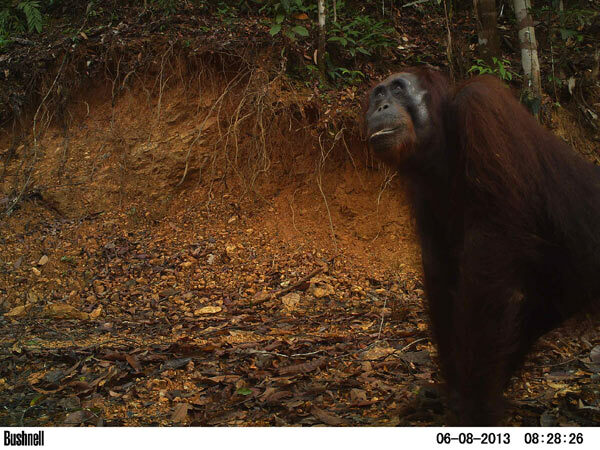 An orangutan checks out a camera trap set along a ridgeline in a primary forest. Photo credit: Brent Loken. The paper notes that orangutans can survive in sustainably logged forests, which should be incorporated into orangutan conservation strategies. However, the level of disturbance that orangutans can tolerate and the distance they can move on the ground remain unknown. “Orangutans still need trees, and lots of them, and protection of Borneo’s remaining forests should continue to be of highest priority for both Indonesia and the global community,” the authors conclude. 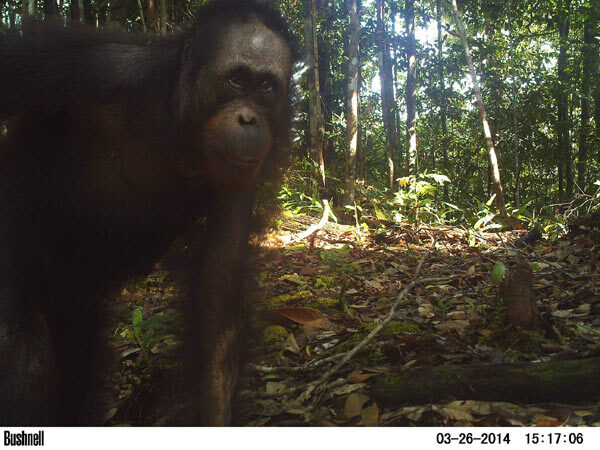 No Comments to "Well grounded: orangutans are more terrestrial than previously thought"